Sigma Delta Tau | Support Fraternity/Sorority Housing! 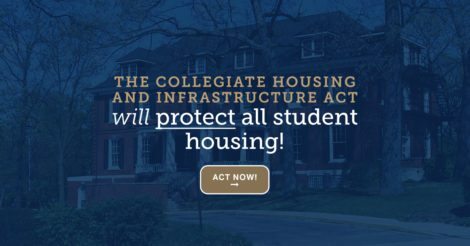 Tell Congress to support the Collegiate Housing and Infrastructure Act. Support Fraternity/Sorority Housing! Tell Congress to support the Collegiate Housing and Infrastructure Act. Fraternities and sororities are the nation’s second largest provider of college student housing. We provide housing – and one-of-a-kind experience – for more than 370,000 of the most active students on campuses. Yet, donations toward building and maintaining our houses are restricted from receiving full tax deductions. The Collegiate Housing and Infrastructure Act (CHIA) would provide our houses with equal access to facility upgrades under the law. By simplifying the tax code, all non-for-profit housing (including fraternities and sororities) will be able to gain incentives to increase funding for life-safety and capacity upgrades like fire sprinklers and alarm systems. If integrated into tax reform, CHIA – which has always enjoyed bipartisan support – will also make a meaningful difference in the student debt crisis, by expanding the offering of affordable collegiate housing options. Now we need your help. Click here to tell Congress to include CHIA in the upcoming tax reform package. The more voices Congress hears, the more likely students across the country will gain the benefits of safe and affordable student housing. Thank you for your support.